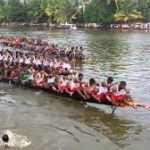 Champakkulam Boat Race / Champakkulam Moolam Vallam Kali will be held on 15th July 2019 at Alappuzha, Champakkulam. Boats belonging to different categories such as Chundan vallam (snake boat), churulan, Iruttu Kuthi, Veppu, etc., take part in this boat race. The snake boat race is the main attraction of Champakkulam Vallam Kali. The festival includes display of attractive water floats and several art forms. The Champakkulam Boat Race is held on Malayalam month Midhunam on moolam day. This Champakkulam Boat Race is constreted a temple at Ambalappuzha Sree Krishna Temple. A Thousands of peoples visits to view this boat race.